Shhh! 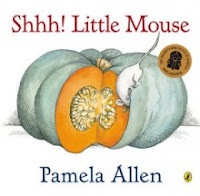 Little Mouse, written and illustrated by Pamela Allen and published by Puffin Books (2007), is captivating in many ways, enjoyable at several levels and a wondrous read beyond the recommended 0-5 age group. It is the middle of the night when the little grey mouse peeps out of his hole in the wall in search of food. The house is quiet. The household is asleep. Little mouse has to sneak past a sleeping cat; an extremely large ginger cat. He tiptoes into the larder and enjoys a smorgasbord of colourful food: biscuits with pink icing, watermelon, pumpkin, cheese, bread, an apple, strawberries and a blueberry pie. Little mouse is washing it all down with a glass of water when he accidentally wakes up the ginger cat. What he has dreaded most has happened. Now he must run for his life. The story is told with few words and the pages where the little mouse is enjoying his midnight feast are wordless. Ideal for engaging very young children in learning about food, each of these pages has just one striking food image, so colourfully and realistically presented that my mouth was watering. Young children identify with the little mouse as he is ‘peering, peeking and tip-toe creeping’ through the house and past the sleeping ginger cat. They are delighted when he finds so much marvellous food to enjoy and they watch with fearful anticipation as the glass of water leans, then tips, then crashes to the floor. Their heartbeats quicken when the noise wakes up the big ginger cat who spots the little mouse and gives chase. In my role as educator I sometimes offer Shhh! Little Mouse to students as old as eight who read it happily and succumb to its enchantment. The simple story line has universal appeal and the illustrations are mesmerising. This is a book that engages children, stimulates communication and provides interactive fun for reader and audience. It is not difficult to see why Shhh! Little Mouse was short listed in 2008 for the Children’s Book Council of the Year Award: Early Childhood. I love Pamela Allen but haven't seen this yet! Thanks for the review. @Kelly It sounds such fun, Kel. I haven't read it either but look forward to it.